Synopsis In ancient times a horde of giants rebelled against the elders and a brutal war ensued. Things looked grave until finally a hero, carrying the Golden Axe, appeared and drove back the giants. Since then, the kingdom of Firewood has been ruled by a family that had mastered the power of the nine crystals to ward off all evil from Firewood. Everyone lived in peace until one of Firewood's ministers betrayed his king and sold the nine crystals to Death Adder, one of the evil giants. Death Adder has hidden the nine crystals in nine dungeons, has unleashed hordes of monsters and is threatening to take over the world. 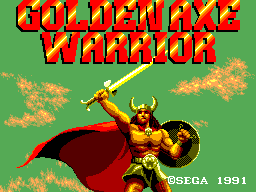 Will there be another hero who can find the Golden Axe and defeat Death Adder?